Bunions form at the joint behind the great toe when a person's foot flattens out too much during the weight bearing phase of gait. This causes the bone behind the great toe to push toward the mid-line of your body putting excess pressure on this bone in shoe gear. This often causes the bone to proliferate here producing the typical knot or prominence we call a bunion. 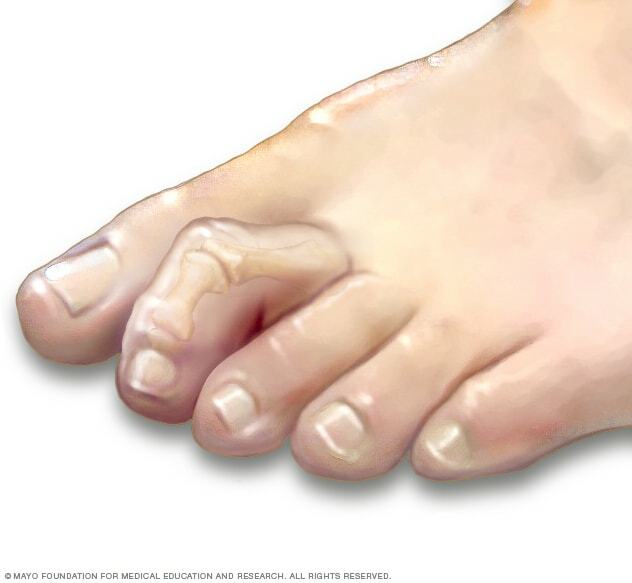 Due to the arrangement of the tendons and supporting ligaments at the great toe joint, progression of the bunion deformity causes the great toe to move toward the 2nd toe. This puts the cartilage inside the great toe joint under excess and uneven pressure and can lead to degeneration of the cartilage and the formation of arthritis. A bursa or fluid sac can form over the bunion where the shoe contacts the bone, causing additional irritation and pain. 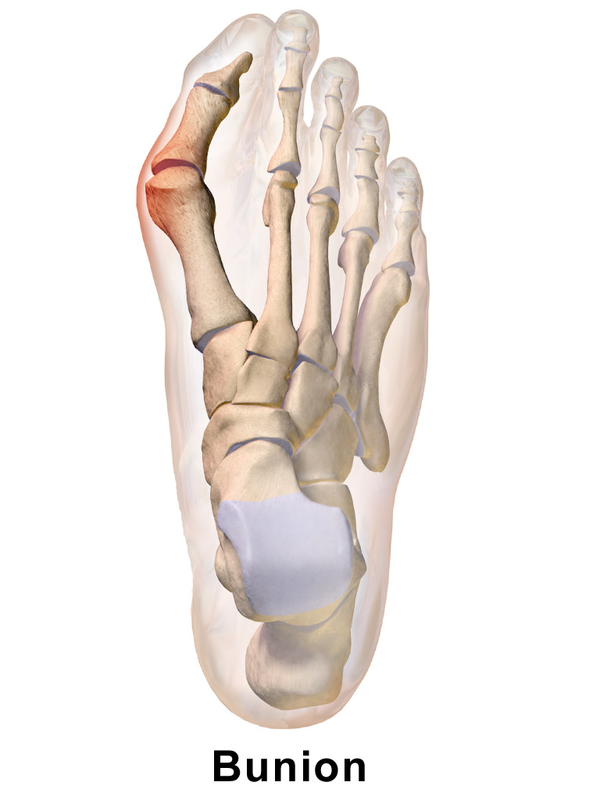 The small sesamoid bones underneath the great toe joint can become dislocated causing a turning or tilting of the great toe leading to jamming of the joint. Any or all of these events can lead to your bunion becoming painful. Initial treatment centers on orthotic therapy, attempting to correct the person's abnormal bio-mechanics which have undoubtedly led to this bunion formation. By improving the function of the great toe joint with the esthetics, we are often able to slow down or stop the progression of the bunion. Supportive shoe gear is also beneficial along with temporary activity modification all geared to relieve your pain. If symptoms persist, surgical correction of the bunion and straightening of the great toe can be undertaken to mitigate your bunion pain. There are several million diabetics in the U.S. today and the number increases each year. Most people with this condition require regular care and monitoring by their Internist or Primary Care Physician. Manifestations of diabetes often occur in the feet making a relationship with your podiatrist crucial to your long term well being and care. Diabetes can interfere with the blood flow and sensation in your feet leading to a decreased ability to heal even minor wounds and injuries. With sensation loss, injury can occur to your feet which initially might be underappreciated in its severity in the diabetic patient. This could lead to infection of the wound which could lead to loss of your foot/leg/even your life. Because of increased blood sugar level, diabetics are essentially immuno-compromised making it harder to fight off infection once it starts. Injuries to the toenail due to trauma or ingrowth are very serious in the diabetic as these conditions can predispose the person to infection. Corns and calluses that are allowed to form and grow unchecked can lead to breakdown of the skin and ulcer formation, again opening the person up to infection. It is critical for the person with diabetes to establish themselves with a podiatrist so that every effort can be made to both prevent diabetic complications in the feet and to immediately treat any issues that might arise. Once the patient loses feeling in their feet an/or experiences a decrease in blood flow to their extremities, they are at risk of losing their feet. They should see a podiatrist every 2 months for routine nail care and for monitoring. They will be advised on shoe gear and fitting, regularly checked and followed for any progression of their symptoms, and screened for any eminent complications. These at-risk diabetics should not trim their own toenails as injury here could occur leading to an ingrown toenail and infection, and loss of tissue. The diabetic should inspect his or her feet each day and pay close attention whenever changing to or wearing new or different shoes. Skin should be moisturized daily to prevent callus build-up and cracking on the heels. Athlete’s foot and fungal toenails should be aggressively treated so as to prevent infection and tissue loss as well. Close control of your blood sugar is paramount in preventing/minimizing the potential complications of diabetes. Wound care often becomes necessary in the diabetic when conservative measures or activities/shoe gear changes have rendered a portion of the skin on their foot vulnerable to injury. Ulcer formation is a serious condition no matter how small the initial wound may seem. Immediate assessment and treatment by a medical professional are essential to minimize loss of tissue and morbidity. Initial treatment includes assessment of the wound for infection and depth, debridement or removal of any non-viable tissue, and application of dressings appropriate for the type and severity of the wound. Timely follow-up is imperative so that the wound can be monitored for any changes. Off-weighting the ulcer with felt, insoles, post-op shoes, or a cam walker are all considerations. Aggressive treatment of any infection is essential to the healing process. There are many dressings and wound therapies available to treat these ulcers and we often employ a combination of therapies to heal the wound as rapidly as possible. Referrals are given as needed to address any underlying aggravating factors affecting or contributing to the wound with Vascular consultation being at the forefront here. Healing diabetic ulcers is always a team effort involving the patient, the podiatrist, the primary care provider, social support and at times requires other medical specialists and home health care. The best treatment of all for a diabetic ulcer is to PREVENT it in the first place. Hammertoes occur when the person’s foot flattens out too much becoming unstable in gait. This causes the tendons which balance the toes to pull on said toes at an altered angle, causing the toes to curl at one or both of their joints. Over time, this change in positioning of the toe joints can become semi-rigid or fixed, preventing the toes from straightening out during gait. This in turn can cause a degenerative type of arthritis and pain in these toe joints. This can lead to painful corn formation on the affected toes. Again, treatment here is focused on correcting the person’s gait using orthotics in the shoe. Padding, finding shoes with deeper toe boxes, and keeping corns trimmed can all provide symptomatic relief. If the pain persists, the toes can be surgically straightened to correct the deformity and re-balance the joints. The most common cause of heel pain is plantar fasciitis--the plantar fascia is a thick ligament located just under the skin on the bottom of your foot. It originates from the covering on the heel bone and extends out to the ball of the foot dividing into slips that enter the undersides of each toe. This fascia helps support and form the arch of your foot. Over time, gravity wins the war of arch height and your arch moves lower putting the fascia on stretch causing micro-tears in the fascia at its origination site on the heel bone. This results in pain, swelling, and can lead to spur formation. Typical symptoms include: pain with the first step in the morning with some improvement upon walking, pain again after sitting during the day, pain late in the day--all focused on the bottom and inside of your heel. Over time this pain can migrate to other parts of the heel and arch causing you to alter your gait and this can result in Achilles’ pain, back--knee--hip pain as well. Treatment early on is focused on reducing the strain on the fascia by supporting the foot. We can achieve this by using tape, arch supports, and advising you on proper shoe gear. It is important to also include treatment for the inflammation in the heel using ice, oral or injectable anti-inflammatory, along with a temporary reduction or modification in your weight-bearing activities. Once inflammation is controlled and your pain reduced, stretching can be employed to complete your recovery. Long term prevention for plantar fasciitis relies on support of your arch as provided by orthotics which are worn inside your shoes. For milder cases or symptoms, over the counter orthotics often provide adequate relief. For those individuals with more persistent pain, custom orthotics can be made by prescription to specifically address your biomechanics and activity level. Wearing supportive shoe gear is imperative here--shoes with a rigid mid-sole and firm heel counter provide the best support and also allow your orthotic to work more efficiently. Paying attention to all these factors will help ensure pain-free activity and healthy feet. Pain associated with toenails is a common complaint among our patients and is often related to the shape and/or thickness of the nail plate itself. Ingrown toenails occur when the sides of the nail plate and the surrounding skin encroach on each other. Heredity can play a role here--some people just have curved or C-shaped toenails that turn down at the edges, predisposing the toenail to grow into the skin. Others have thick, yellow, fungal type toenails which can cause excess pressure to be exerted out from the center of the nail forcing the edges into the skin. Injury and trauma to the nail plate often causes the nail to change shape and ingrow. Biomechanical forces can play a role here as well. If your great toe deviates toward the 2nd toe, this can cause a rubbing or irritation at that side of the great toenail causing the skin to grow onto the nail plate causing pain. Narrow shoe gear can cause a similar irritation and ingrowth of the great toenail where the shoe contacts the toe. Treatment for ingrown toenails includes both temporary versus permanent avulsion or removal of the ingrown toenail or its borders. These procedures are performed in the office under local anesthesia and provide immediate relief of the patient’s pain. Treatment for fungal toenails often includes topical medication along with treating the entire foot and the shoes via anti-fungal soaps and sprays. People often re-infect themselves by way of their shoe gear so attention to this fungal source is essential to long term relief.